The “Who’s Been Here the Longest?” competition during visitors’ night at United Methodist Youth Institute was no contest. Alumni of the weeklong gathering, simply known as Institute, were asked to stand if they were there in 2010, then 2005, 2000, with one attending in 1980. But the winner was in the next-to-back row of Baldwin City First United Methodist Church, which was packed for the midweek celebration on July 18. Evelyn Jackson, nearing her 99th birthday, attended the youth gathering from 1936-38, when it was at Southwestern College in Winfield – one of several that used to take place in the state. The lone site for Institute in the Great Plains has been at Baker University for many years. Although she didn’t keep in touch with others she attended Institute with – remember, this is many decades before social media – she remembers early morning wakeup calls and singing “Gospel songs and our hymns and silly songs,” even launching into a ditty about “Epworth Leaguers,” the precursor to United Methodist Youth. Not only was Jackson the oldest alumnus in the sanctuary, she was the first of four generations who have attended Institute, all of whom were in attendance: her daughter, Doris Housh, and granddaughter, Deanna Likes, were also there, to see Jackson’s great-grandson, Ira Likes, attending his first Institute. Doris Housh -- Jackson’s daughter and Ira’s grandmother -- attended Institute for several years while it was at Kansas Wesleyan in Salina. “It deepened my faith,” said Housh, office manager at Lenexa St. Paul’s UMC, who attends Shawnee Monticello UMC with her mother. Looking over the congregation of alumni and this year’s campers – 83 of them, plus another 20-some counselors – she said she felt good. Deanna Likes, Ira’s mother, said “it’s kind of surreal being here” with Institute alumni she hasn’t seen in decades. “I kind of feel like I’m part of Institute’s history, and my mom and my grandma are part of Institute’s history, and now my son gets to be a part of it,” said Likes, communications coordinator for Manhattan First UMC. The Rev. 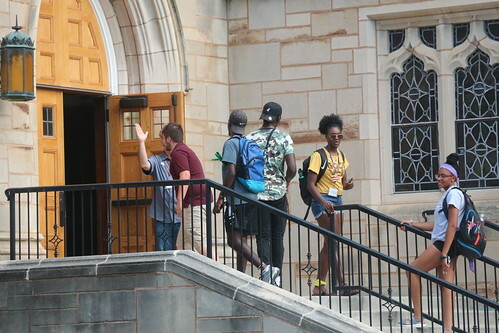 Kurt Cooper, community life coordinator for Institute, said the Baker University-based sessions were one of the earliest of what numbered into the hundreds in the 1920s and ‘30s. Cooper said campers get a variety of experiences while spending their week in Baldwin City, from large worship services to small group discussions, and word-of-mouth keeps new attendees coming every year. Rev. Jeff Clinger, spiritual life coordinator for Institute, was one of those youth who was partially inspired to go into the ministry because of his week in Baldwin City. “It’s such a unique community in that acceptance and welcome is lived,” said Clinger, pastor of Topeka First UMC. “There’s a culture that kind of continues from year to year, session to session. “It’s just that special atmosphere,” he added.